Mechanics can fix the seats, but the damage to the airline’s reputation was already well underway and will likely persist long after the seat clamps are repaired. American Airlines canceled almost 100 flights as the carrier moved to install additional locking mechanisms on 48 Boeing 757 aircraft to keep seats from coming loose in flight. American cancelled 44 flight Friday. Photo by Grant Wickes. The Fort Worth-based carrier said mechanics will be adding a second locking device to secure the seats to the floor of the cabins. The work should be completed by Saturday, said David Campbell, American’s vice president of safety. The original “seat lock plunger mechanism” had a small pin which in some instances was failing to keep the seat in place. “We believe over time normal wear and tear, general debris such as soda spills, coffee, things like that got into the mechanism and it didn’t allow that pin to reset,” Campbell said. Mechanics found 22 out of 5,184 locking mechanisms that were not working properly. 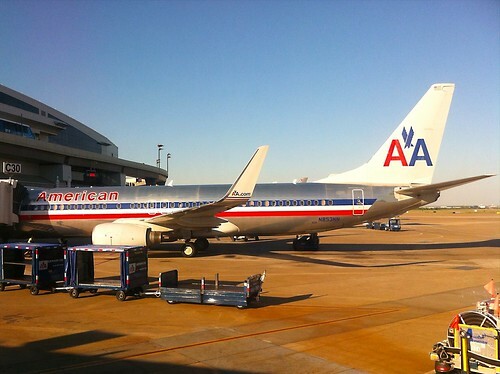 American is working with the Federal Aviation Administration, which has approved the second locking mechanism, Campbell said, adding that the FAA is also conducting an investigation to see if other carriers that operate Boeing 757s may have the same problem. The carrier started pulling planes out of service around 1 p.m. Thursday to begin working on the aircraft. Campbell said it takes about two to three hours for mechanics to complete the work on one aircraft. American canceled 50 flights Thursday and 44 today in order to make the repairs. The problem with loose seats first came to light on Saturday when American flight 685 from Boston to Miami had to make an emergency landing at New York’s JFK airport after a row of three seats came loose in midflight. Another aircraft had a similar problem Monday, prompting the inspections. Separately, American Eagle announced Thursday it has reached tentative agreements with its mechanics and ground school instructors. “These agreements address the needs of our people and still allow us to achieve the cost savings necessary for our company to succeed,” said Eagle spokesman Bruce Hicks. American Eagle’s parent company, AMR Corp., had filed court motions to reject contracts for its mechanics, ground instructor and dispatch union workers. A hearing currently scheduled for Oct. 23 may be moved to give mechanics and ground instructors time to vote on tentative agreements. The company is still negotiating with its dispatch group. The Transport Workers Union, which represents 1,330 mechanics and ground school instructors, said the agreements include no pay cuts and no pay freezes. “If ratified, the agreements provide for 1.5 percent increases in 2015 and 2016 for our members,” said the TWU, adding that a ratification vote will be scheduled soon. The TWU also confirmed that more than 2,800 union employees opted for the early buyout program from American. American had initially expected to cut 8,650 TWU jobs as part of its bankruptcy plan. The union said that with 2,800 early buyouts, the carrier will need to lay off about 1,800 TWU employees, including fewer than 500 mechanics, fewer than 100 stock clerks and approximately 1,200 in the ground service workgroup.